Mushrooms are not only delicious, they are also an excellent source of B vitamins and selenium and contain a powerful antioxidant. I made this easy creamy mushroom soup that is full of mushrooms flavor last Sunday. I served it with wholemeal walnut bread as light lunch and my family enjoyed this soup very much. Clean mushrooms with a damp cloth and chop the caps and stems. Heat up butter in a medium pan and saute onions till soft but not browned. Add in garlic and mushrooms and cook over high heat for 3-5 minutes whilst stirring constantly. Sprinkle plain flour over the mushrooms, mix well till combined. Pour in the hot chicken broth + water and bring to boil. Add in bay leaf and simmer at medium heat for 15-20 mins. Remove bay leaf and leave the soup to cool for about 5 mins. Place the soup in a food processor or hand blender. Blend well till smooth in two batches. Return the soup to the pot reheat until boiling and add salt to taste. Then lower to medium heat and stir in whipping cream, stir well and serve. When serve add a dash of ground black pepper on soup. Hi Ann! Thanks for sharing this mushroom soup recipe. Easy to prepare and very nice! But my children preferred a thicker texture. I wonder where had I gone wrong. Is it because I didn’t put enough mushrooms? Or maybe I should add more flour? Oh, I actually didn’t use whipping cream but replaced with fresh milk. Is it the reason? Normally 1 litre of liquid (500ml chicken + 500ml water) can be served for 5-6 persons. Hi Ai Li, This Farmers Union Thickened cream is cooking cream according online. So this can be used. Looks very appetizing. Nice with toast bread. I love mushroom soup… I wish my family loved it as much as I do! Oh I love mushroom… this one is good, hubby will definitely love this. He couldn't eat without any soup… I'll try this! thanks for sharing! happy weekend! Yum! My husband and I would love this soup. We are huge mushroom fans. The soup looks delicious! Do you think dried mushrooms can be substituted for fresh ones in this recipe? Thanks. You mean Chinese dried mushroom? I think fresh mushrooms is so much better that they really bring out the aroma of the mushrooms. This mushroom soup of yours looks perfect! I have nit attempt to make mushroom soup before, but looking at yours is really inspiring! Thanks for sharing this. have a nice day and see soon. Mmmmmmm, sounds and looks delicious girl. Now how "bout that wholemeal walnut bread recipe??? I was raised in Stockton, Missouri..the black walnut capital of the world. Just in case inquiring minds want to know! LOL! Ya'll have a wonderfully blessed day a sweet!!! Did I ever mention that this is my favorite soup in the world, actually my comfort food:) But you knew that and mad it for me…lol This is perfect! I love to use king oyster mushroom too for this mushroom soup. I usually to get an earthy flavour, I bake the shittake mushroom first to make broth. Love combination of yellow colour here! mushroom soup is at the top of my soup list…the woodsy flavor of mushrooms….yum…..yours looks so very very good! Wow Ann, the mushroom soup looks really comforting. Hmm…Loving it with some baguette. Yummm… Hope you're enjoying your evening. Cream of mushroom soup is one of my favorites. Yours with the shitake mushroom sounds delicious. I am definitely in for homemade mushroom soup – real stuff! I used to eat a lot of Campbell mushroom soup as a kid :O…but I know those canned stuff are not really good. Ann, I love mushroom soup too but cannot consume frequent cos too fattening hahaha… urs looks so creamy and thick, must b very delicious. Jess, you can omit the cream if you don't want it. nice recipe.. thanks for sharing !! Ann, this looks really good and I love mushroom soup. Nothing like the homemade kind that's for sure! yum….=] I love mushroom soup! I've never made it before though….only the canned stuff =D It's cool how the soup turned sort of purple! Mushroom soup with cream sounds real good!! My mouth is already watering! Cream of mushroom is one of my favourite soups and with walnut bread is even better. Truly a perfect combination!! Nothing beats a good and nutritious homemade mushroom soup.. Ours are sometimes instant creamy mushroom soup.. not a good mummy I am..
will try this in future.. Thanks Ann. 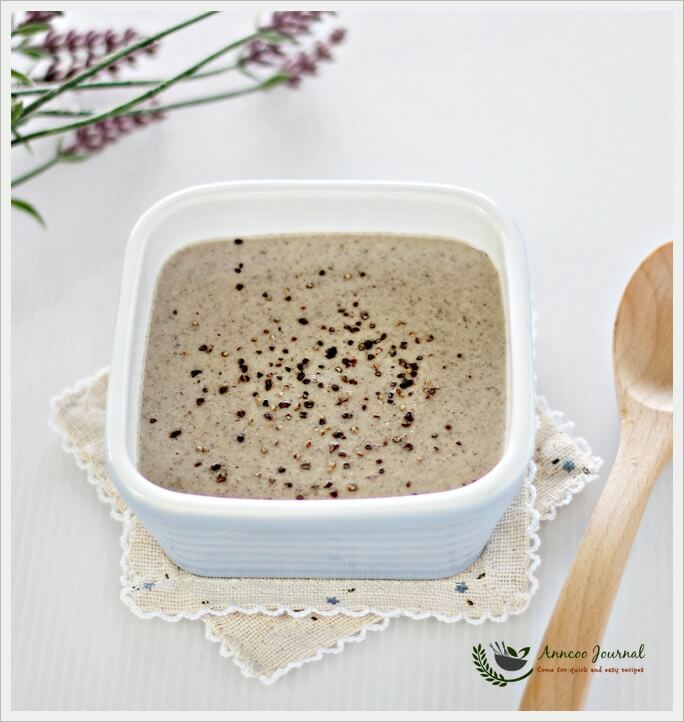 Mushroom soup is very healthy and easy to make. Love your pictures, very colourful. Thanks Lia for your nice compliments. The mushroom has a light purple colour…which looks very beautiful and appetizing! what a beautiful colour of that soup! That looks simple and delicious. I think my daughter would love this as she likes mushroom soup. Sometimes she buys the ready mix and cook it. Ann, thanks very much for sharing. This is really quick and easy. You must cook this for your daughter. I usually use canned of cream mushroom or chicken to make chicken pie. Ur used 500g of mushroom, I am sure your soup is full of the goodness from mushroom. I would like to have a bowl especially today's weathr is so cooling. Hmm…yummy! I love creamy mushroom soup. Shitaki mushrooms definitely add a twist of flavor to this cream soup. I have only tried white button mushrooms for my mushroom cream soup. Will add shitake next time. I love mushroom soup! Yours looks to thick and creamy, yummy!!! nice light meal indeed. Speaking of which I still haven't made any soup this winter. Love your yummy soup and the pics are so cool!